Adiós Utopia memorializes the driving utopian conceit of contemporary Cuban art, its galleries a testament to the credulity of this dream. MINNEAPOLIS — “We must continue dreaming, with the hope that the better world will become a reality — as it will, if we keep struggling,” reasoned Fidel Castro in a 1992 interview with Tomás Borge recounted in the book Face to Face with Fidel Castro. “Humanity should never renounce its dreams, its utopias,” he went on; “struggling for utopia means, in part, building it.” The fabrication of utopia, if ever forward looking, has, at least since the 1990s, looked searchingly to Cuba’s revolutionary past. The ways in which has history has abetted, or even absolved, the revolution hang in the balance of the landmark exhibition Adiós Utopia: Dreams and Deceptions in Cuban Art Since 1950, which opened at the Walker Art Center in November and was on view at the Museum of Fine Arts, Houston last spring. The show was conceived by the Cisneros Fontanals Fundación Para Las Artes (CIFO Europa) and the Cisneros Fontanals Art Foundation (CIFO USA) and draws mostly from CIFO collections. It was organized by the artist René Francisco, critic and curator Gerardo Mosquera, and curator Elsa Vega with museum advisors Olga Viso and Mari Carmen Ramírez at the Walker and the MFAH, respectively. The cultural production of utopia, from the salad days of the 1950s to Cuba’s Special Period, to the present day serves as the exhibition’s through line. Eschewing chronological and generational frames, the curators have explicitly sought to keep history at bay — neither staging an ideological exhibition nor instrumentalizing art in a storytelling function — and ask us to assess the art per se. This apolitical approach to richly and frankly political art marks a path far less traveled in exhibitions of Cuban art, as the organizers of Adiós Utopia are well aware. 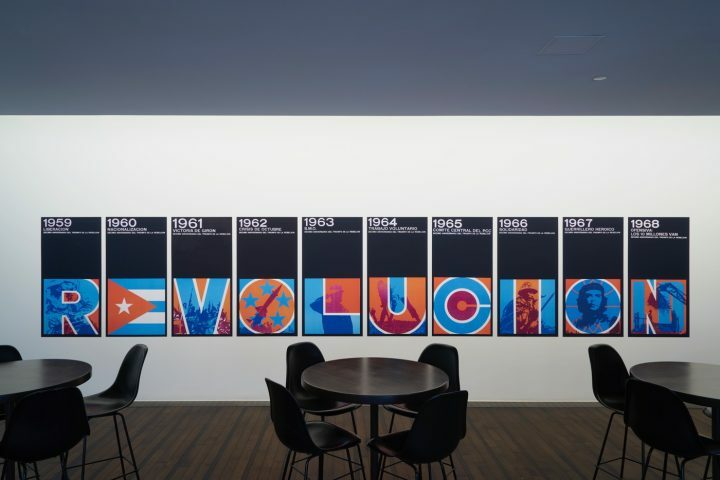 In their selection of one hundred works by more than fifty Cuban artists across a range of media — painting, photography, installation, film, graphic design — they present a thematic (not, they acknowledge, an exhaustive) overview of sixty-five years of artistic production. The conceptual labor of utopia serves as a curatorial leitmotif, introduced in the exhibition’s anteroom in the parodic “Productivism” (1992), by René Francisco and Eduardo Ponjuán, in which a worker — plucked from Soviet social realism — wields a paintbrush. Adiós Utopia proceeds in six synergetic constellations: The Utopia of Concrete Art; Cult and Destruction of the Revolutionary Nation; The Imposition of Words: Discourse, Rhetoric, and Media Controls; A Generation of Silenced Artists; Sea, Borders, Exile; and Inverted Utopias, Lost Illusions. Also included, though spatially and dialogically detached from the main galleries, is a terrific collection of the posters produced by OSPAAAL (Organization of Solidarity with the Peoples of Africa, Asia and Latin America). Conceptually elastic and intergenerational, with the partial exception of the opening presentation of concrete art, the galleries seek to tell, as Mosquera explained during the press preview, the “untold narrative” of those artists who stayed in Cuba after 1959 (before later diasporic and exilic turns) and those who matured during the revolution. The selections largely hew to that standard with a few outliers, for example Mario Carreño and Carmen Herrera, who kept their distance from the revolution. Any caviling would question not the artists included, but rather the omission of certain others, for instance Tomás Sánchez and Manuel Mendive, no less the “utopia” of Afro-Cuba at large. 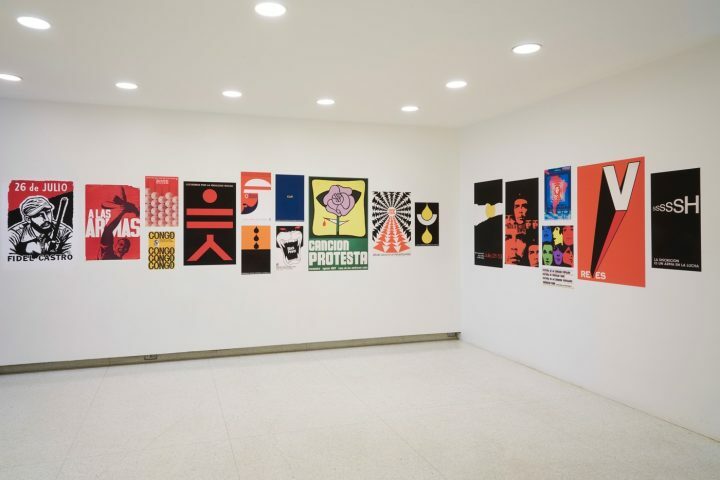 Installation views Adios Utopia: Dreams and Deceptions in Cuban Art Since 1950; reproductions of political posters line the walls in lower Bazinet Lobby. 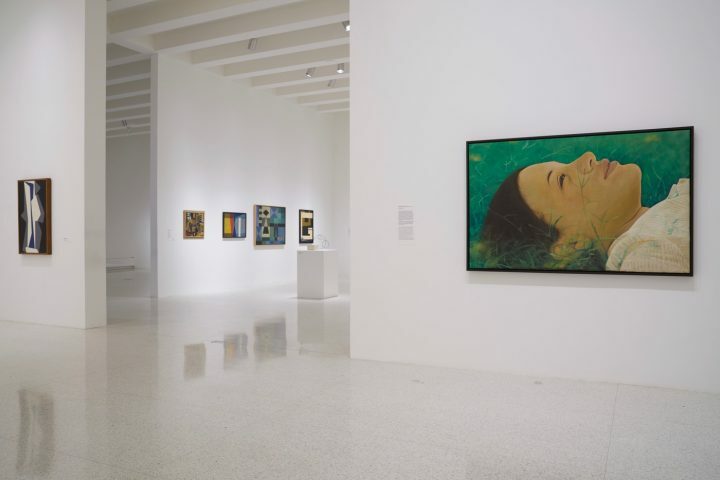 The art of the 1950s, a polarizing decade often held up as the embodiment of pre-revolutionary Cuba for better and for worse, has until recently been absent from studies and shows of Cuban art. The paradigm began to shift around the turn of the millennium, as geometric abstraction across Latin America gained new visibility and the market eventually reached Havana. The exhibition Concrete Cuba, at David Zwirner (London, 2015; New York, 2016), bestowed a crowning touch. The opening gallery, The Utopia of Concrete Art, elegantly recuperates the work of the concretos (Los Diez Pintores Concretos), who advanced concrete art — non-referential and geometric — as a new (ideal) reality. A prelude to the rest of the exhibition, the gallery defines utopia as an abstraction ab initio, its fall effectively preordained. If its idealism is elsewhere debunked, the essentializing terms of this concrete utopia are nevertheless stunning, from the tonal resonances of paintings by Carreño and Rafael Soriano to the dynamic line and color that animate Sandú Darié’s gridded constructions. The conceptual inflections of language come under further scrutiny in the following sections, The Imposition of Words and A Generation of Silenced Artists. To create “Nine Laws” (2014) from the series The Weight of History, Reynier Leyva Novo calibrated the area, volume, and weight of the ink used to print seminal pieces of Cuban legislation. Thus quantified, the texts are distilled into nine corresponding rectangles of black pigment that solemnly render and obscure revolutionary history. A riposte to Kazimir Malevich’s “Black Square” (1915) — a forerunning totem of utopia — “Nine Laws” discerns no transcendence in the nothingness of its black fields; the work looks backward not forward, its temporality recuperative and reflective. 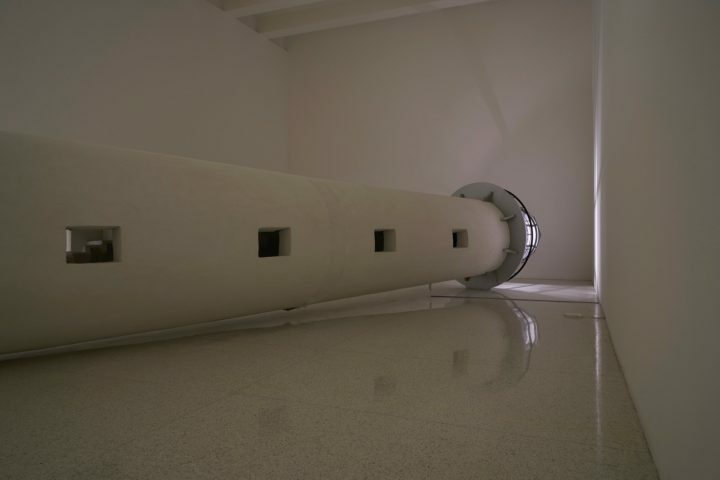 A similar deconstruction of meaning unfolds in José Ángel Toirac’s “Opus” (2005), a remix of Castro’s speeches in which the spoken numbers — data, statistics — are extracted and merged into a continuous audiovisual projection, white numerals flickering vacantly on a black ground. The asphyxiation of speech becomes visceral in works by Eiriz and Umberto Peña, who (with the cartoonist Chago) comprise A Generation of Silenced Artists, the smallest and least realized of the galleries. Peña’s paired, onomatopoetic Pop paintings “He Goes Puf” and “You Go Plaff” (1967) grotesquely metabolize utopia, hemorrhaged from bowels into bulging toilets. The final constellations are dominated by work from the past twenty-five years, from the Special Period to the post-ideological present. Two signal exceptions date from the 1960s, both in the Sea, Borders, Exile section: José A. Figueroa’s rending photograph “Olga” (1967), in which the separation of exile is telescoped in the distance between hands waving farewell at Havana’s airport; and Luis Martínez Pedro’s untitled paintings (1963) from the Territorial Waters series, which transfigure concrete aesthetics into geopolitical premonition. The geographical circumscription of Cuba preoccupies this gallery, specifically in regard to the exodus of the 1990s (earlier-generation exiles are absent, and in places missed). “Utopia was over,” quips de la Nuez in the exhibition’s catalogue. “Diaspora began.” A raft formed by textbooks, Kcho’s “Selected Works” (1994) nourishes the balsero’s mind (not his body). The dramatic “Felled Lighthouse” (2006), by Los Carpinteros, allegorizes the fall of power. Inverted Utopia, Lost Illusions suggests no closure to Cuba’s utopian dream but instead leaves us interminably in medias res. We are trapped in tautologies of surveillance, as for example in Lázaro Saavedra’s four-channel video, “Suspicion Syndrome” (2006), and futility, as the engraved text revealed in Iván Capote’s sculpture “Dyslexia” (2003) acknowledges: “life is a text that we learn to read too late.” The crisis of communication (and censorship) is further hypostatized in Yoan Capote’s daunting sculpture “Stress (in memoriam)” (2004–12), composed of human teeth wedged between concrete slabs, and in the wryly phallic tongue of Esson’s painting, “The Ball/Gossip or the Speech” (1989). In “Born on the First of January” (2013), Alejandro Campins’s apocalyptic landscape, the romance of the ruin — here, a camp in Minas de Frío (Sierra Maestra), a recruitment ground for the army — is awful and sublime; a palimpsest of the past, its atmospheric colors are those of the revolution, faded and metaphysical. The relentless wrangling over utopia remains relevant for Cuba’s many contemporary artists who choose to remain on the island — even as, or perhaps because their markets are global — and for whose work the revolution remains a touchstone. Their approach is often reconstructive and agnostic rather than political or ideological: for example, Carlos Garaicoa’s imagined architectural restoration, “On the Construction of the Real Tower of Babel” (1994-95) and the inclusion of the Foreign Investment Law (2014) in Leyva Novo’s “Nine Laws.” Adiós Utopia is similarly equivocal. As declared in the gallery wall text, the exhibition declines to “illustrat[e] a historical narrative” and rather presents “important works that address crucial questions, and that can establish a dialogue visually and conceptually in the space.” It succeeds, and brilliantly, on these terms. 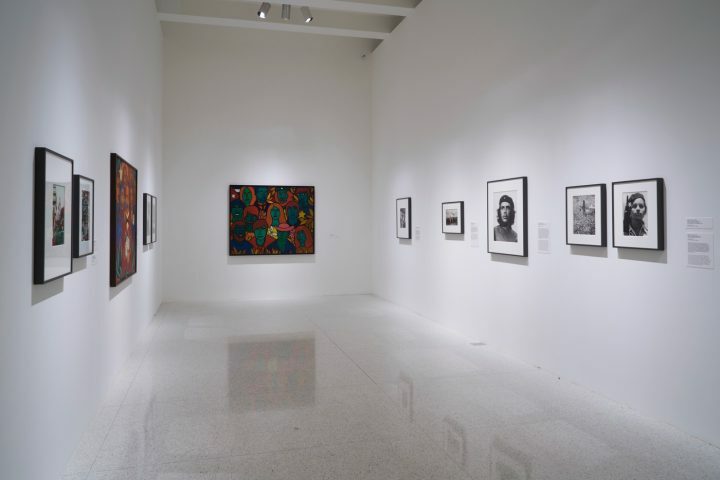 A milestone exhibition, it stitches together an unprecedented panorama of revolutionary art, canonizing artists and — not least — presenting them to audiences in the United States, where contemporary Cuban art has with few exceptions found scarce institutional support. The accompanying catalogue, with a useful chronology and essays by the curatorial team as well as Antonio Eligio (Tonel), Rachel Weiss, and de la Nuez, is an essential and richly illustrated sourcebook. The persuasive eloquence of the art notwithstanding, the exhibition’s abstention from narrative comes at the cost of meaning, that is, of history and its incumbent judgment. “History will absolve me,” Castro declared in 1953, in defense of the attack he led on the Moncada Barracks that marked the opening volley of the revolution. History did effectively legitimize the revolution, providing its early moral imperative — redressing the imperialist depredations of the republic — and it endures, mutatis mutandis, as a marker of collective, national identity. Later exhibitions will doubtless adjudicate upon revolutionary (art) history. Adiós Utopia meanwhile memorializes the driving utopian conceit of contemporary Cuban art, its galleries a testament to the credulity of its dream, long dismantled and yet perpetually present. 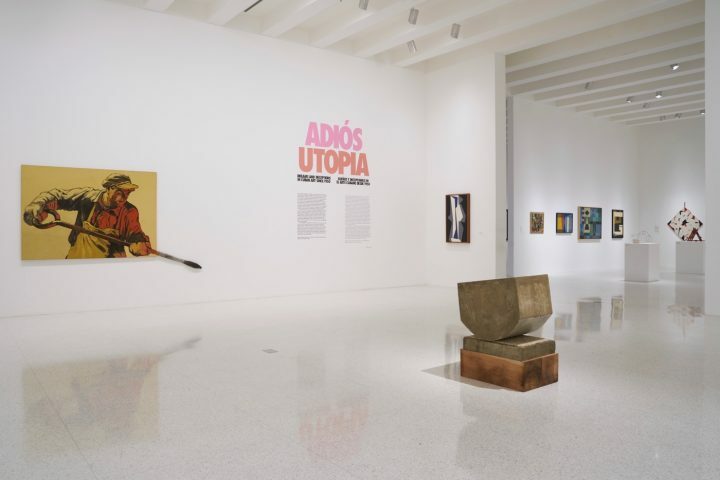 Adiós Utopia: Dreams and Deceptions in Cuban Art Since 1950 continues at the Walker Art Center, (725 Vineland Place, Minneapolis, MN) through March 18.